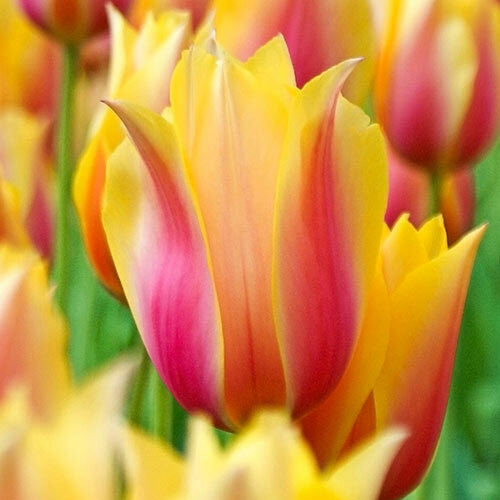 In a blend of colours that rivals the best tropical sunrise, these staggeringly tall late-season tulips will be the cherry on top of your best spring show yet! 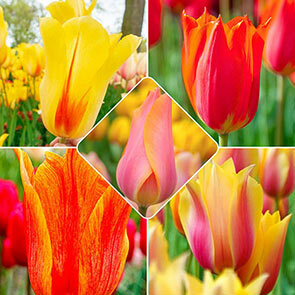 Our Towering Perennial Tulip Collection includes the groundbreaking Temple of Beauty, plus four of its best sports. Temple of Beauty was introduced back in 1959—the tallest tulip they'd ever seen and soon to become a two-time award winner! It was such an extraordinary variety, the hybridizers, D.W. Lefeber & Co., quickly set to work creating more. 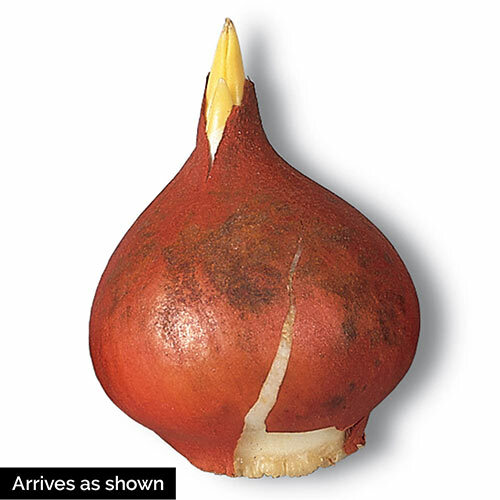 During propagation, slight genetic variations, or "sports," would emerge. These were cultivated into Hocus Pocus, Big Brother, Blushing Lady and El Niño. They have some important similarities—they all reach the same soaring 35–40" heights and produce massive blooms at the same time, so they're guaranteed to perform beautifully together. However, each cultivar is unique, so you'll enjoy a jaw-dropping range of colours. These late-blooming tulips create a vibrant tapestry at the end of spring. They're perfect for planting around our WOW! Deluxe and Pride Perennial Tulips. 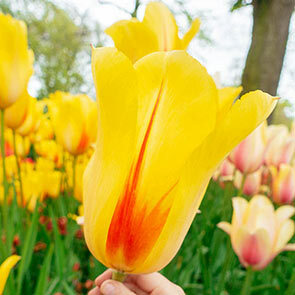 Towering Tulips will bloom last and extend the season. Also, when spring staples like daffodils and hyacinths begin to fade, Towering Perennial Tulips keep the momentum high until your sizzling summer show can take over. Most tulips you'll see around the neighbourhood bear the classic egg-shaped flower. 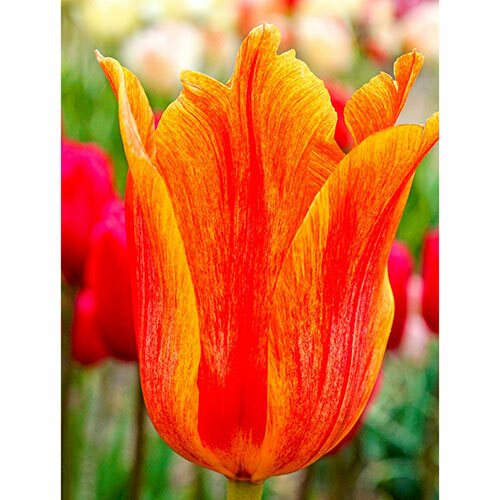 Towering Tulip blooms stir things up with an elongated, chalice shape. They're incredibly large, reaching up to 6", or sometimes even 7" long, which is the perfect canvas for such an amazing range of colours. Height is powerful in the garden. At the back of a border, these sky-high tulips will provide the most impressive finishing touch. They are all hardy in zones 3–8, simply find them a sunny to partially shaded spot and watch them go! You'll be rewarded with years of a carefree, fast-growing and completely breathtaking show. These 50 top-quality bulbs all produce massive, sky-high tulips at the same time in late spring. 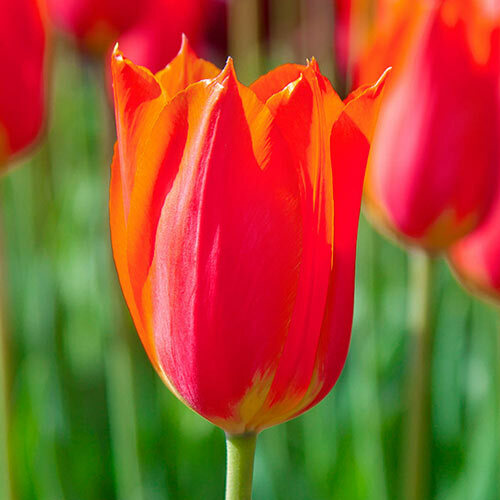 In size alone, there's no mistaking them for average garden tulips, but that's just the start! Look inside to see what makes each cultivar special. Hocus Pocus: Eye-catching Hocus Pocus will put you in a trance with brilliant red flames flickering across the yellow petals. It's so easy to spice up a cut-flower bouquet when you have these blooms on hand. Temple of Beauty: The one that started it all, Temple of Beauty, boasts commanding height and huge flowers. Deep salmon-rose petals with darker and lighter flushes add even more drama to the mix. With slight mottling, even the foliage is unique. It's no surprise that Temple of Beauty has received the coveted Royal Horticultural Society's Award of Garden Merit. El Niño: You will not find two El Niño blooms that are quite the same. Amber, orange or sometimes both are overlaid with stripes of rose or specks of red. The colours get more intense as the bloom matures! While the exact pattern is a surprise, the result is reliably impressive. Blushing Lady: This tulip is a staff favourite! The softest shades of rosy-pink and light yellow blend so elegantly into one another, who could help feeling charmed? 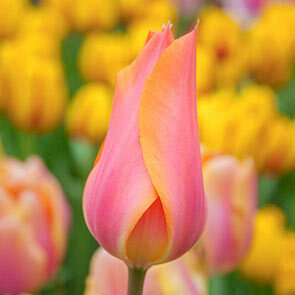 The incredible bloom size and plant height help Blushing Lady Tulip stand out even more, both in the garden and vase. Big Brother: The aptly named Big Brother delivers a grand performance in the late-spring garden. These fragrant blooms appear in the most outstanding colours—apricot to salmon-rose, illuminated by apricot-gold edges and a pale lemon-yellow base. Flower Form Huge, 6 to 7" chalice-shaped blooms. Foliage Type Gray-green, linear foliage. Planting Instructions Plant 6" deep and 3 - 6" apart. Pruning It is important to let the foliage mature and die down naturally, do not cut back. Next year's bloom is being developed.